Item is a lot better now - we've been down to the park for an hour this afternoon - though she did wake up and need the loo about another 15 times this morning. Phew. Tomorrow's an INSET day and The Boy is going to take the day off work. He was going to take her to work with him, but as it's a nursery, taking a germy child in probably isn't the best idea. 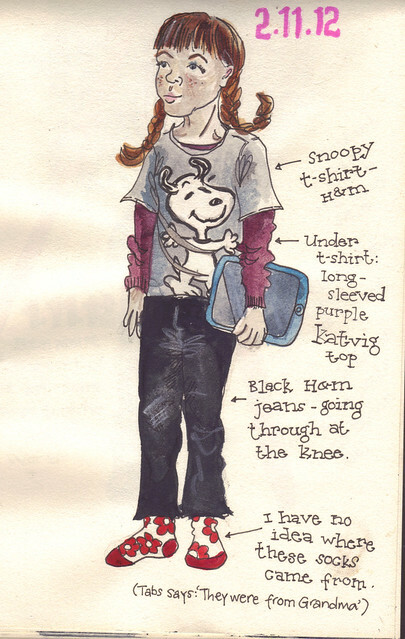 So - lots more time for drawing our clothes. What we're learning from this exercise is that as well as drawing rubbish hands, I can't do skin-tones either. The guy who is really active running life drawing classes in Brighton does one specially for hands; I should probably put that on my wishlist. I'd like it even better if it was a nicer colour than grey, but having said that, grey always goes with everything and is unobjectionable. I'm also wearing skinny black jeans from M&S and a pair of running socks because I thought I was going out for a run today. I totally didn't, partly because of Item being sick and partly because by the time we came back from the park, I didn't feel like it (am now castigating myself for this decision). You can't really tell, but I was having a good hair day as well. Nothing much to say about these except that everyone loves the bright blue boots. So would I, if I had some. 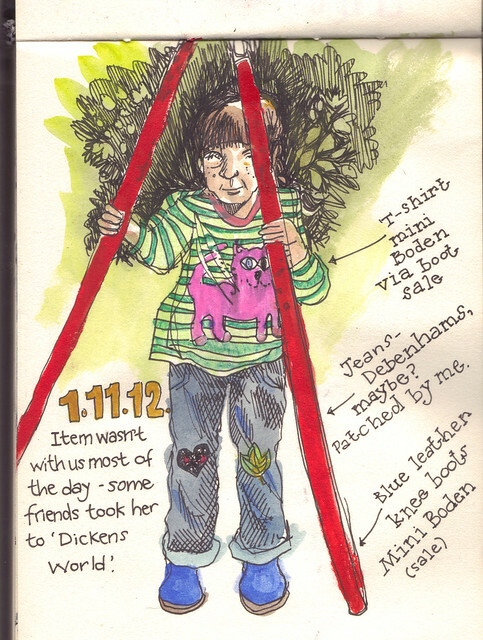 Also, doing these, I realise how many of my and Item's favoured clothes are from boot sales or charity shops. Item was wearing a predominantly H&M outfit that day. I suspect this is a common state of affairs for most kids in the country. That t-shirt shows Snoopy doing a happy dance, always a good image. Item doesn't choose this t-shirt by herself (maybe she's drawn to brighter colours? ), so it's a sign that The Boy dressed her. I always know when The Boy dresses Item as his default is the stuff he understands - a t-shirt and jeans - and he'll rarely put her in a dress. This is today. Item wore pyjamas all morning and her getting herself dressed was the first sign of recovery. 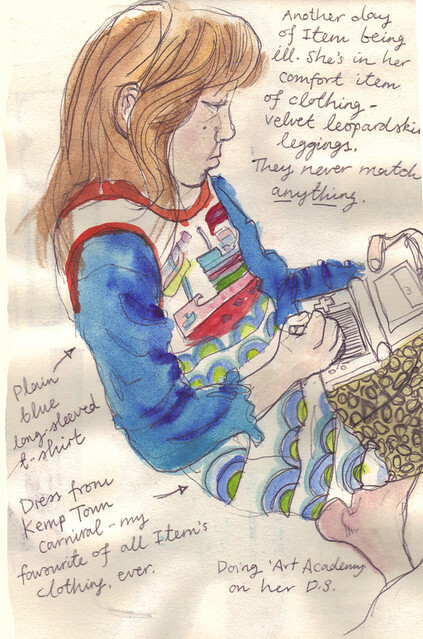 She chose her velvet leopardskin leggings which are her default comfort garment (I often sigh when she puts them on because they're hard to match to anything else at all) and this t-shirt material dress which is my favourite piece of Item clothing in the entire world (and having just watched several thousand pictures of Item flash by as I back them up onto a second computer, I can testify that it is up against several hundred garments, many of which I barely remember. And some of which I will forever think of with great fondness). It has a cartoony image of a steamer ship on it, in (I assume) Seventies graphic design. There's no label so I don't know who made it or anything else about it. We got it from a woman at the side of Kemptown festival one year, who was just selling a few bits and bobs of girls' clothing and toys. That's it. Item rarely wears socks around the house unless someone manhandles her into them.